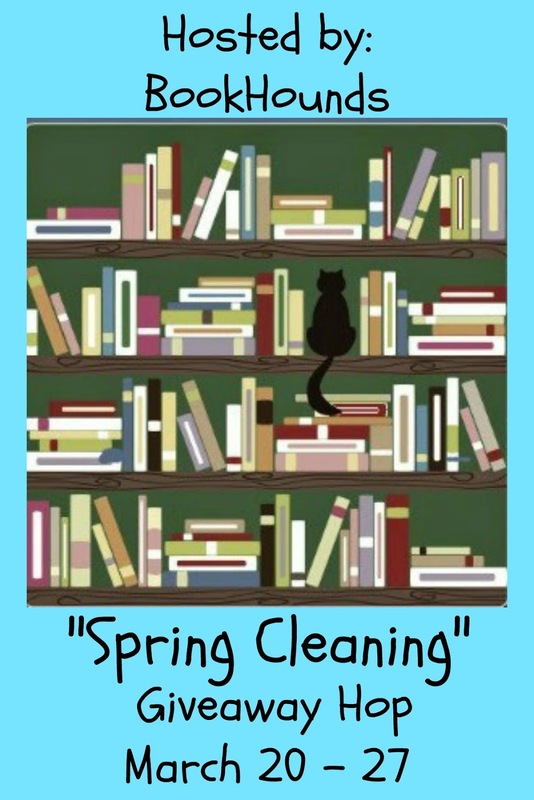 Welcome to the Spring Cleaning Giveaway Hop hosted by Bookhounds. 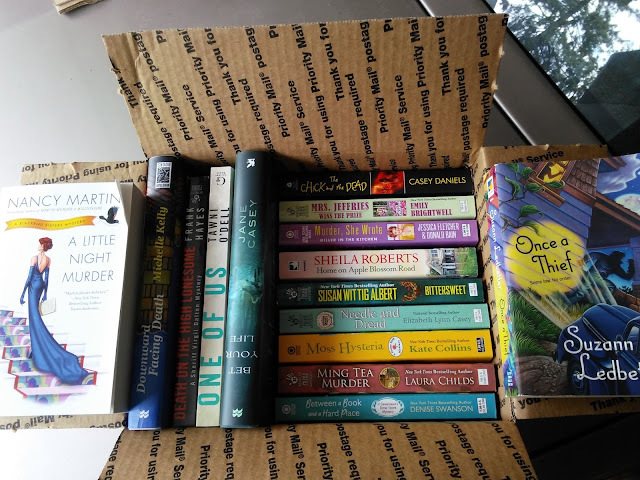 Fill out the Rafflecopter below for your chance to win this pawsome box of books! My husband would say I hoard, but I do go thru and share quite a few with friends. Mostly a hoarder, but I give away and share the ones I've read. I try to clean them out every few years, but I never mange to donate many. every so often, trying to give away more... but, mostly i just move them to other shelves! I have to get rid of books every now and then so I can make room for more books. I hoard books, but once in a while I remove a few books. We donate from time to time. Most of the used bookstores for trade are gone alas. I hoarded for years but now I pass along books to other ravenous readers I know! I am a hoarder. Lucky for me, so is my husband when it comes to books. I only get rid of my doubles (I donate them to a library that puts them into circulation). I'm NOT a hoarder, I'm a collector, with books going back to the 1960's and earlier. Many of them are either first editions or first printings. Lots of them are autographed or personalized. I have close to 3000 books in two rooms and a storage bin. I will clean out ones that I did not really like but the rest are hoarded and guarded well. I can't even lie, I'm a book hoarder. I think getting rid of books would nearly kill me. Thank you for sharing this, Melissa and Mudpie! time to do my own spring cleaning as well! I usually clean out my bookshelves 2 or 3 times a year. We are fortunate to have many bookshelves, so I don't need to go through them and weed out books often! I keep the books I love and I donate the ones I don't want to read again. I usually donate the books I read and don't get attached to away to Purple Heart or Jubilee Missions. I have to clean them out some when my shelves are full. So I pass them along to friends who I know will read them. I clean them off every so often...but it's not easy. I hoard my books. It is so hard for me to get rid of any!!! I give all my books to my grandmother and to my sister, so I clean it out regularly! I'm pretty much a hoarder. However, I did start a library at my church with most of the books I had already read. I only hoard the ones I love ... which is all of them. Ha Ha Ha! I go through them every couple months and I'm still a hoarder! I pass books along to relatives, friends or the library. I do still have full bookshelves. I do clear them out every once in a while and either sell them to the used book store or donate to the library. Some books I pass along to family and friends and others I donate. If I've read it I either trade it or donate it. I get rid of books to make room for more. It varies from year to year. Sometimes I gift and donate lots of books. Other years I hoard. 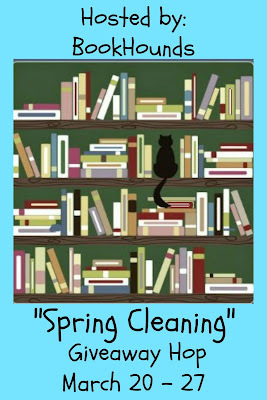 Clean out once a year and donate to the library book sale. I only keep the ones I absolutely love. All others are donated to libraries or given away to family and friends who want them. I really, really, really try not to be a hoarder but it always seems that if I manage to weed out 5 books I replace them with 10 more! Not sure if it's hoarding or laziness, but nothing ever seems to leave the shelves. I hoard them. Books are the only thing I hoard. I clean them out, letting other share in the read and then donating all the returned ones. Thanks for sharing. I'll clean them out every so often (usually when I want new books but can't afford any), I usually take them to a used book store for some credit. I hoard them. I swap some (on Paperback Swap and Book Mooch) but then get others in return. I never donate any but I should. I actually hoard my books and have 100s of them. I'm a hoarder definitely, I know I need to weed some out, it's just finding the time and figuring out which I want to donate, trade, or sell. Thanks for the chance to win a bunch of awesome books. I do clean out my shelves every so often, but I don't get rid of much. I am a book hoarder, but I have a box of books that people can choose from when they come over. I usually don't keep books after I read them. They go straight to the library so it's not really necessary to do much cleaning of my shelves. I clean out my bookshelves to make room for more...but I keep a zillion of them! I clean them out once in a while & send them to deployed service members. I hoard them. I hate getting rid of books. I clean them out occasionally so that I can make room for more. I am a book hoarder! Especially if I really enjoyed it, I keep it to re-read in the future! I try,but they are kind of a mess. I try getting rid of them but if I'm reading I like saving them and when I have the whole series read one right after the other. I don't have a bookshelf yet. I have bee collecting books lately though so soon I'll need a better place for them al! I clean out my bookshelves every six months. I hoard in between. I clean out my bookshelves every year or so. I always let my family pick out a few and then take the rest to my local library. They put them either in their system or in the Library book sale. The money goes back into the Library so it's all good to me. I am definitely a book hoarder!! Hoard, though If i didn't enjoy a book, I'd give it to someone who would. Thank you for the chance, those books look interesting. I clean them out about every six months. I then usually give away to friends or donate them. But I am still considered a hoarder, and I am okay with it. I'm a total hoarder! I will occasionally lend books out or give away a book I didn't enjoy. I usually hoard them. I don't remember the last time I got rid of any books. I just cleared out about 400 books and donated all of them. Now I have room for more! I clean them every so often. I'm normally a hoarder, but we moved recently and I decided I would finally have to go through my gigantic stacks of books. It was a bittersweet day. I donate most of my books to our local hospital. They have a section in the main lobby where visitors can buy used paper backs for 25 cents or hardback for 50 cents. This way there is a variety of reading material available to people and the hospital can make a small profit that adds up over the year to buy new machines. I get most of my books from the library. If I do get books I don't want to reread I'll donate them. I will clean out ones that I did not really like but the rest are hoarded and I reread them. I never in my life I'll get rid of a book out no matter what. They are very important to me. I accumulate them no matter if I have no space. I hoard them mostly, but I donate some to the library eventually...except of course for my very favorite series collections! Thank you for a wonderful Giveaway!! Honestly, I try to pass books on, take them to used bookstores, etc. but I'm a hoarder at heart. We tend to keep them. I am a horrible, horrible hoarder. I even have multiple copies books I've been known to re-read. "Collector authors" have hardbacks and paperback copies, sometimes even two paperbacks, one for collections purposes, and one for reading. Of course, books I know I'll never read again get donated. I don't keep books I'm not going to read (or cherish for collection purposes). If I didn't hate a book, though, I might try reading part of it again prior to donating, because I've been known to fall in love with a book the second time around. Most of the time, if the book is horrible (to me) on the first read, it's a goner(unless it was a gift, then it's cherished). My daughter gets first dibs, though, if it's appropriate (YA). I mostly hoard. I do share them with my sister after I read and then she hoards. I so hoard them! They are overflowing! I am pretty much a hoarder but twice a year I do give some to the local animal rescue's garage sale. I have a very hard time getting rid of any of my books. I hoard them but will share with family and friends. I clean out my bookshelves and donate to the library bookstores. I have a tendency of hoarding but I do try to clean out my shelves every few years! I confess...I'm a book hoarder! I don't get rid of them; period. I am here to share my testimony of how gracious i am to God I am being blessed through this wonderful man called Dr. Ogudugu. My life is back!!! After 3years of Broken marriage, my Wife left me with two kids. I felt like my life was about to end i almost committed suicide, i was emotionally down for a very long time. Thanks to a spell caster called Dr Ogudugu via: (greatogudugu@gmail.com),which i met online. On one faithful day, as I was browsing through the internet,i came across alot of testimonies about this particular spell caster. Some people testified that he brought their Ex lover back, some testified that he restores womb,cure cancer,and other sickness, some testified that he can cast a spell to stop divorce and so on. I also come across one particular testimony,it was about a woman called Ana,she testified about how he brought back her Ex lover in less than 2 days, and at the end of her testimony she dropped Dr Ogudugu e-mail address. After reading all these i decided to give it a try. I contacted him via email and explained my problem to him after doing all he ask me to do. In just 48hours, my Wife came back home to me and the kids. We solved our issues, and we are even happier than before Dr Ogudugu is really a gifted man and i will not stop publishing him because he is a wonderful man...If you have a problem and you are looking for a real and genuine spell caster to solve all your problems. Kindly contact High Dr Ogudugu via: greatogudugu@gmail.com anytime, he is the answer to your problems. You want your ex lover back? You want to be famous or rich? You want to be good academically honorable? Do you have a problem in your married life? Do you want to win the lottery or win a court case? I hope you find the solution and be happy as i am now ..So brothers and sisters i have tested this man Dr Ogudugu spell temple Trust and i have found that he is real and genuine. I am now the happiest Man on earth today, Contact his email id and be joyful in your life. (greatogudugu@gmail.com) Tel: +2348142250751 More gratitude and thanks to you again the Great Dr Ogudugu. Wow i never thought i will happy in my life ever again, i want you all to thank DR OGUDUGU of GREATOGUDUGU@GMAIL.COM, he is a father that takes care of his children the spell caster of our time, he has saved me from a very ugly situation that almost made my life miserable and i want you all to thank him for me,my husband and i have be married for so many years now with children and the relationship was being threatened by a small girl in his working place,she was almost destroying my home i met so many spell casters but to no avail until i met a friend who came from africa and she told me about DR OGUDUGU, and i decided to contact him and try him out as i was losing faith in all spell casters, but he told not to worry that now am in his temple everything will be alright he assured me 100% that his spell has no side effects and that it will work straight and save my home and my marriage and after he has performed the sacrifices and casted the spell, my husband came back to us with love and affection and he loved us more and more and he never looked back or none did his love for me waiver, if you are also experiencing this sort of your situation in your home, if your husband is drifting away, if you are experiencing a broken home or you have lost your husband to a young woman outside there then look no further help is here as GREATOGUDUGU@GMAIL.COM is ready to help you out okay for any of your problem is it financial needs, revenge spell, job spell, promotion spell what kind of spell do you need DR OGUDUGU is going to solve it for you okay i have promised him to always talk of his good works to the world in general and to any body who cares to listen, you can email him on his personal email on or GREATOGUDUGU@GMAIL.COM and he will attend to you as soon as possible okay once again his email is GREATOGUDUGU@GMAIL.COM.